A sale of a commercial real estate is a process as complex as any M&A transaction. Very often organized under high pressure of time, involving many people, it requires professional preparation to Due Diligence and further negotiations with potential buyers. Especially that any real estate’s documentation made available in the course of a transaction is often much more extensive than documents relating to any other companies. Whether it is a sale of a single property, or execution of many transactions, the FORDATA solutions allow you to efficiently manage documents in these processes and improve communication with buyers. FORDATA Virtual Data Room PRO is an innovative version of our system, which was created in response tthe needs of investment directors. It allows you tmanage multiple sales transaction simultaneously and independently. Within a single transaction it enables torganise Due Diligence in a professional and effective manner. Thanks tQ&A (Questions&Answers) module it increases effectiveness of negotiations with multiple investors. What are the additional possibilities? 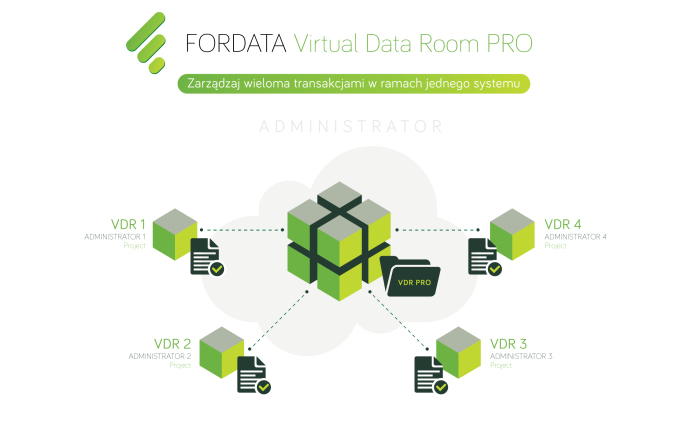 If you are preparing for a single transaction, consider our basic solution, the FORDATA Virtual Data Room. The service will allow you to organize Due Diligence in a safe and efficient manner. See why commercial real estate companies choose FORDATA platform to support their confidential projects. We highly appreciate the professionalism and flexibility of FORDATA consultants. During the cooperation we could count on their support, in both technical and organizational matters, e.g. in terms of proper organization of document structure and the management of access rights for groups and users. VDR was used in the process of sale of one the largest commercial real estates in Poland. It was very important to us to maintain the highest security level both while organizing the process and finally when giving access to documentation to invited parties. FORDATA security policy, compatible with PN-ISO/IEC 27001:2005 standard, put into practice together with specifically implemented security mechanisms (watermarks, encrypted connections, access rights distinction) guaranteed the expected level of security.